When trying to run VirtualBox on Ubuntu 16.04, or some other version of Linux, you might get a following type an error message, when trying to start a virtual machine, you just created on a fresh installation of VirtualBox. 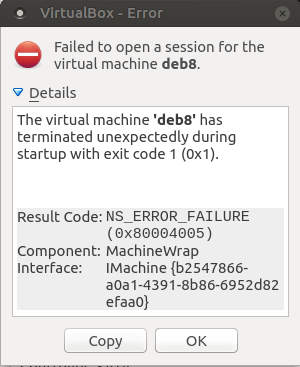 VirtualBox might return error saying that it failed to open a session for the virtual machine. Details of error message will say that virtual machine has terminated unexpectedly during startup with exit code 1 (0x1). You will also get a “Kernel driver not installed (rc=-1908” message. 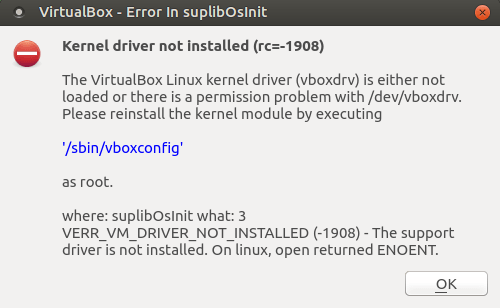 Error message will ask you to try to reinstall the kernel module by executing /sbin/vboxconfig as root, to reinstall the module, which could fail to complete successfully when you try to run the command in terminal. One of the possible causes of this type of behavior is that you have Secure Boot enabled in your BIOS on the host machine, which is preventing the install of third-party drivers, and causing issues with VirtualBox installation, which fails to install all kernel modules. To resolve this error, disable Secure Boot in your BIOS, and then try to run /sbin/vboxconfig command as root, or reinstall VirtualBox, with Secure Boot disabled, to install all the necessary modules.